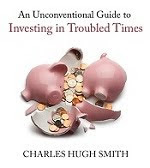 oftwominds-Charles Hugh Smith: Will China's Currency Peg Be the Next to Fall? I suspect China's leadership is wary of unpegging the RMB for one reason: the FX market is too large to manipulate for long. What is China's currency the renminbi (RMB, a.k.a. yuan) really worth? Nobody knows, because price discovery has been thwarted by the RMB's peg to the U.S. dollar. This peg has shifted over time, from 8-to-1 some years ago to the current peg of 6.24-to-1. What does the peg mean for China's currency and economy? Gordon T. Long and I discuss the many issues in our latest video program (see below). A pegged currency rises and falls against other currencies along with the underlying currency. As the dollar weakened from 2010 to mid-2014, China's RMB weakened along with it. This allowed Chinese authorities to lower the peg without affecting the competitive value of the RMB. Now that the USD has gained 16% in less than a year, that rise is dragging the RMB higher with it, making China's goods less competitive in markets outside the U.S. (and countries which use the USD as their currency). This major move has prompted Chinese authorities to widen the peg's range to allow the RMB to weaken slightly against the dollar. Japan's stunning devaluation of the yen has prompted much speculation that China will be forced to either end the peg to the USD or loosen the peg to match the depreciation of the yen. What will happen should China end the peg and allow the RMB to float freely on global foreign exchange markets? Nobody knows, and that uncertainty is likely one reason why Chinese leaders are maintaining the peg. Uncertainty is disruptive, especially when it affects the value of currencies, which then affect the relative competitiveness of China's all-important export sector. When China does end the peg, many factors will go into pricing the RMB on the global market. Currencies generally act like other commodities: their value is set by supply and demand. If there is strong demand for RMB and limited supply on the FX market, the value will rise. If there is low demand and abundant supply, the value will decline against other currencies. I suspect China's leadership is wary of unpegging the RMB for one reason: the FX market is too large to manipulate for long. China's leadership is accustomed to controlling key elements of the Chinese economy, and the idea that the global market would determine the critical value of the RMB rather than the Chinese leadership must be sobering. Though much is made of China's huge stash of foreign-currency reserves (almost $4 trillion), FX markets trade more than this sum every day. China could clearly defend its currency for quite some time, but even $4 trillion isn't enough to defend a valuation that is wildly out of touch with the market. A currency reflects much more than the interest paid on the issuing nation's bonds and its foreign reserves: fiscal and trade deficits/surpluses, the vibrancy and resilience of the economy, the ability of the central state to manage the economy, private bank credit, transparency, costs of corruption, ease of doing business, how foreign investment capital is treated, the skill levels of its workforce and so on. One cost few seem to factor in is China's enormous unfunded liabilities--not just pensions and healthcare, but the staggering costs of remediating its horrific environmental damage. These costs will be a drag on China's economy for decades to come, and the treasure needed to repair the damage will come out of private profits, wages and government revenues. If nothing is done to truly remediate China's immense environmental damage, the cost will be borne by its residents in poor health and productive lives cut short. That's not something that can be pegged to another nation's currency. Thank you, Karl L. ($75), for your stupendously generous contribution to this site-- I am greatly honored by your steadfast support and readership.